Yes, I'm back. It's been a bad week, so I thought I'd vent my spleen on the blog! Apart from the car needing some work doing on it I had a nightmare journey to do a talk last night - the directions were spot on - except the road that should have taken me straight to the venue was closed and a diversion in operation - meaning I hadn't a clue where I was at the end of it! That followed a day when work hadn't gone well. One rod section fell off the dryer while I was out, requiring the blobbed varnish stripping off and redoing. All that and I'm getting fired up for some breaming and can't get my new rods finished. 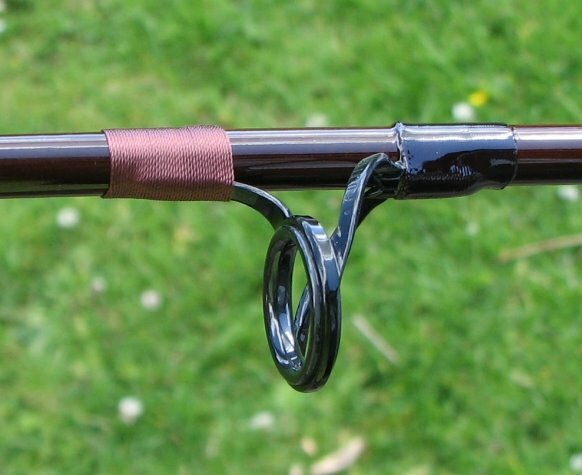 I'm sure that many a customer has thought I was making excuses when I have told them there's a hold up with their rods as the UK distributors for Fuji are out of stock of one size of a particular rod ring. But it's always true. I ordered up three sets of Alconites for the new rods, and all bar one size turned up. I did what I could, but I'm still waiting on the missing rings. In the past I have phoned up the distributors to find out when delivery from Japan is expected and the answers have ranged from 'We don't know', to 'It could be three months'. Here I am with three rods, handles fitted, most rings whipped and nothing I can do about it. So, when I have some varnish left over from paying jobs I've been sealing the whippings. As the photo below shows, coloured threads darken considerably when varnish is applied and soaked into them. That pinky/brown turns a lovely dark brown a little darker than the blank colour. That's just the sealing coat on the right. A top coat will be applied to level everything out and make it look smart - eventually!